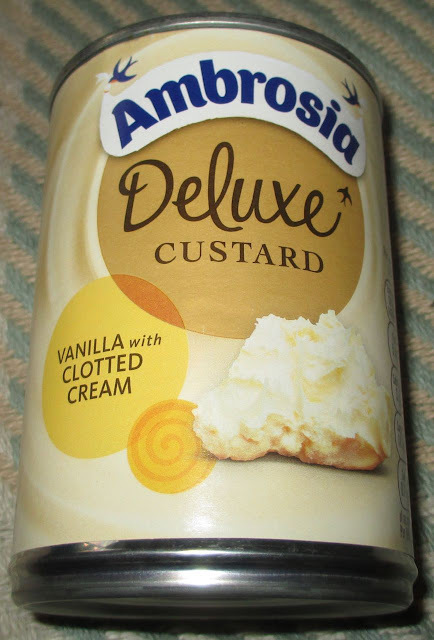 We don’t have custard very often, so I thought we might try out what looked like the poshest canned variety and therefore we went for; Ambrosia Deluxe Custard. Its deluxe nature comes from the recipe containing West Country Cream, and clotted cream at that. The can got poured into a pan and heated on the hob. While it was cooking I could see that the custard was thick, and we poured it over some steamed syrup puddings. Spectre had enough to completely cover his, he is a bit of a custard fan. I found the custard to be of a very good flavour. The taste was richer than regular custard and the vanilla seemed to be more developed. Reading the ingredients I was pleased to see that it is a proper vanilla extract rather than an artificial flavour and I think this really helps. The custard was extra creamy too, and the West Country Cream shone through making this seem like a proper treat. I was impressed that I could tell the difference between this and regular custard and I have to admit I did like the thicker texture and more indulgent taste. As I said we don’t have custard very often, so I think I will be buying this again. If you are going to do it, you may as well do it properly.